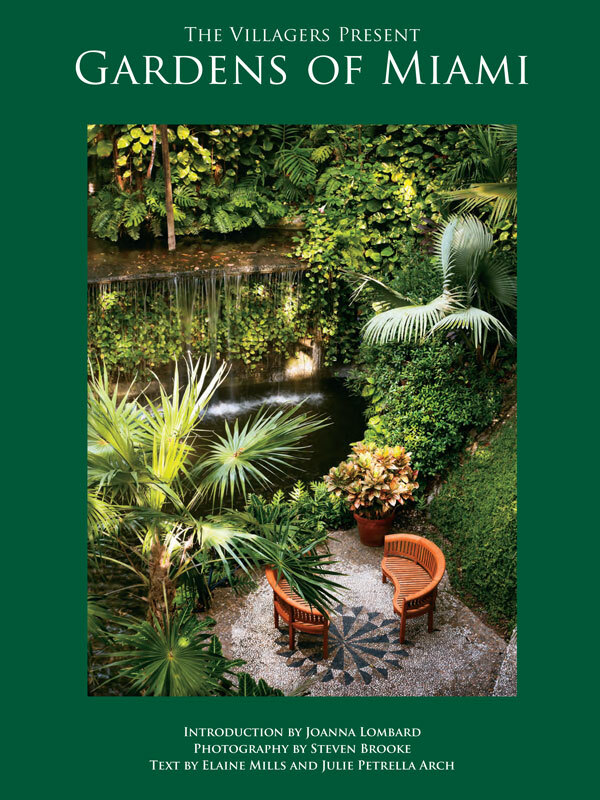 History Archive | The Villagers, Inc.
Work began in earnest to develop a new Villager publication about the gardens of Miami. A steering committee was formed to begin planning, goal-setting and budgeting for this major multi-year project. The successful December House Tour focused on the arts with the theme “Miami Elegance: An Artful World.” The “Tropical Storm” quilt raffle. The lovely spring Garden Tour, “Garden Concepts” featured five homes as well as the public spaces of Merrick House and Fewell Park. The art rental program, special events, and Hunt rounded out fund-raising efforts for a total of $60, 882. Funding of grants from the prior year continued. A group of 10 Villagers experienced an amazing visit to Nantucket at the invitation of the UF School of Architecture professor who heads up the Preservation Institute Nantucket. Major fund raising efforts were enhanced with special programs like Macy’s Shop for a Cause, special events and unique projects like the Quilt Raffle (“Something’s Fishy!” was this year’s theme), Villager Art Rental Program and special sales of chutney and attic treasures. Moving the annual Holiday House Tour to Saturday was a huge success with close to $30,000 raised “Scouting for History.” The always popular Garden Tour “Gateway to Garden Wonders” featured four homes mostly in Pinecrest, generating another $20,000 and the entertaining Historic Hunt featured the theme “Water, Water, Wherever!” The combined total raised from all projects and events was $69,771. It was a banner year for grant-giving, with more than $83,000 awarded for projects such as restoration of the courtyard and fountain at William Jennings Bryan Museum Magnet Elementary School, restoration of original light fixtures at The Miami Women’s Club, development of a historical preservation website at the University of Miami School of Architecture, and iron and wooden from doors at Montgomery Botanical Center. Grants were also awarded to Plymouth Congregational Church to restore the roof of the old school house, repair outdoor sculpture at Vizcaya, restore a stairway at The Kampong, restoration of the courtyard at the Curtiss Mansion, electrical work at Tropical Audubon’s Doc Thomas’ House, and a challenge grant to Miami High School for a WPA mural restoration. The Dade Heritage Trust received funds to educate 100 teachers during a Dade Heritage Days workshop, and $32,000 was awarded for 14 college scholarships in architectural preservation and related fields. Scholarship recipients included three from the University of Miami, four from Florida International University, one from the University of Florida, and six to graduating seniors at Miami’s Design and Architecture High School (DASH), for the college or university of their choice. Members were kept busy with activities that ranged from attending theatrical plays, a performance by the New World Symphony, Brunch at Paradise Farm and a trip to the new Marlins Stadium. They also visited the Lighthouse Keeper’s cottage on Key Biscayne and paid tribute to the new sculpture of Julia Tuttle’s at Bayfront Park. 2010 was a busy year starting with several members attending the Florida Trust Conference on the West coast in Lee County. This was followed by two representatives attending the National Trust Conference in Austin, Texas. The Villagers were active in local politics, protesting giant billboards to be erected on a building near the Arsht Center. The group updated the brochure for The Villagers, Inc., now in glossy color. Fundraising efforts were outstanding, raising over $76,000. The House Tour “A Vintage Day on Biscayne Bay” partnered with the Charles Deering Estate was a fantastic success. The Garden Tour “Private Gardens of Old Cutler” was spectacular and brought in almost $25,000 as one of the most successful tours. Finally the Historic Hunt, featuring a search for historic women of South Florida was a fun and profitable event. A total of $83,400 in grants was awarded, which included the George Merrick Foundation, the Boy Scout House, Montgomery Botanical Center, The Vizcayans for repair of the angel statue, Waterway Renaissance Project, Dade Heritage Trust, Gusman Theater of the Arts, Deering Estate Foundation and others. The Villagers received accolades and “thank you’s” from the Deering Foundation at Vizcaya, Miami History Museum, Dade Heritage Trust, and the Tropical Audubon Society. Members invited to the University of Florida were honored with the “Spirit of Historic Preservation Award” in recognition of exceptional dedication to the field of historic preservation in the State of Florida. The group was very proud that two members were recognized as “Women of Impact” by the Women’s History Coalition. One last activity members enjoy every year is decorating the Christmas Tree at the Barnacle with an old-fashioned theme. 2009 began with a trip to Palm Beach for the Florida Trust for Historic Preservation. Ten Villagers attended the conference. And they presented a check for $5000 to the Trust to help reduce the mortgage on the Trust’s headquarters. The Villagers were presented a Medallion from the University of Miami which recognized the Villagers for over $50,000 scholarships donations over the years. Once again, five $3,000 scholarships were presented to Florida Colleges as well as awards to four DASH students. A documentary the group helped fund showcasing Vizcaya, was premiered on PBS. The group also helped underwrite “Coral Gables: Building a Dream,” a book created by the Shenandoah Middle School Museum Magnet students. A donation of $7000 was contributed the friends and relatives of Eileen Hoffman for the Lighthouse Keeper’s Cottage on Key Biscayne to install a back gate and add foliage to the area. At present efforts persist to find a dingy to place outside the cottage. Newsletters are now sent to the membership by email to keep everyone up-to-date on all activities. The partnership with Bloomindales was a success this year earning $7,450 ($1,000 more than last year). Both the President and Vice President spent a very informative session at the National Trust, which took place in Nashville, Tennessee. The tree was decorated for Christmas at the Barnacle, a yearly tradition. This year’s House Tour showcased Pinecrest and Gables and grossed over $40,000, clearing $35,000 after expenses. It was a very successful House Tour, featuring the annual quilt “Bacardi Mixer” raffle and sale of the 2009 angel Christmas ornaments. Members worked at the Green Festival in Coral Gables in January and in February The Villagers received a plaque from the Plymouth Congregational Church recognizing the donations to the 1887 school house. The plaque will hang in the schoolhouse. The Garden Tour featured fabulous gardens and a wonderful tour and earned $21,842.69. At Pinewood Days, The Villagers were presented with a bench to be placed in the Pinewood Cemetery in honor of the groups’ help. Of the 3,000 cookbooks published in time for last year’s house tour they were sold out in 16 months. The organization had fantastic speakers and venues during the year and were able to print another Member’s Business Directory. The Hunt and auction was a great success and lots of fun with the silent auction clearing $7,551. 2008 started with recognition from many sources thanking The Villagers for the contributions and services given to the community. During the dedication of Courtroom 6-1, Villagers were presented with an historical courtroom picture for the archives. The bronze plaque lists The Villagers as one of the three top donors. Donations paid for all the lights and lamps which were duplicated from pictures of the lost originals. Scholarships were presented to students from the UM school of Architecture and other comparable schools at University of Florida and Florida International University. The Villagers received a water color picture of the Douglas Entrance with an attached plaque from an organization in Tallahassee called Friends of Florida. The first member activity of the year was "A Magical Bus" ride to view many places Villagers have helped restore over the years. After years of work, the latest Villager cookbook arrived in December just in time for the House Tour. “Cook It Like A Native - Recipes & Stories From Dade County’s Colorful Past” was an instant hit with 1200 were sold during the year at a profit of $47,000.00. The cookbook was developed by Villager members who worked to have the cost of the cookbook completely underwritten by donors in the community. A special cookbook event was held at the George Merrick house. Recipes was prepared and given to the people at the event. Bloomingdales Charity Event was a success, and with the hard work of members, $6200 was raised. Once again the tree at the Barnacle was decorated by members. The house tour was held in Coral Gables with houses showing a variety of architectural styles. It was very successful and generated $33,119.45. The quilt was named “Flor Da Lilly” and brought in raffle proceeds along with sales of angel Christmas decorations, chutney and other tasty treats. Members celebrated their success at a delightful Holiday party. In January, members worked and supported the Green Festival in Coral Gables. Another member activity took the group to the Bonnet House, a wonderful historic site in Ft. Lauderdale. The Policies and Procedures Committee finalized a list of good practices and methods to do business, and copies were sent via email to the membership. The next member activity was The Redland Riot Tour. The Garden Tour was fantastic and after expenses cleared $22,823.47. The Hunt was by all accounts a winner. It was well-attended for a good profit and the silent auction made over $6,000. Items not sold were sold at a later date. At meetings during the year, members were grateful for fantastic speakers who educated and entertained. In September 2007, The Villagers held the first “Committee Fair”, for members to sign up for the committee they chose to work on for that year. This proved to be quite successful for educating members about the work of each committee. Then members were off and running with various fund-raising projects, which began with the Bloomingdale’s Shopping Event in October. After receiving a portion of ticket sales and a percentage of store sales for that day, $7,136.02 was raised. In December, a group of Villagers met and decorated the Christmas tree at The Barnacle. Next was the Annual House Tour which featured six outstanding homes and the famous Villagers Boutique with homemade breads, the famous Villagers chutney, and Villagers angels were for sale. A quilt made by a group of members was raffled for additional revenue. Profit for this activity was $30,088.32. The Garden Tour in the spring featured five outstandingly beautiful gardens and profit of $14,240.55. As a result of fund-raising, grants were presented to the following: Old Miami High; Virginia Key for doors to the storage area for the train; Ye Little Wood for research on the area; Montgomery Botanical Center for partial restoration of the guest house where visiting scientists stay; University of Miami School of Architecture for images on the monograph for Marilyn Manley, and Actors Playhouse for a display case. Five $3,000 scholarships were awarded students studying architecture concentrating on historic preservation as follows: 4 to students at the University of Miami, 1 to a student at FIU, and 1 to a student at University of Florida. Five additional scholarships in the amount of $1,000 were awarded to students at DASH. The Villagers were honored for contributing $25,000.00 for lighting replication for the restoration of Courtroom 6-1 at the Dade County Courthouse. But the group was not all work and no play. There were several wonderful member activities during the year, including the annual Holiday party, golf clinic, Redland Riot Bus Tour, “Footloose” at the Actors Playhouse, and a tour of the Wynwood Art District followed by lunch in the Design District. In 2006-2007 The Villagers, Inc., celebrated its 40th anniversary with a variety of field trips in the greater Miami area: “A Magical History” bus tour to take a closer look at many of the places that members’ work helped restore, narrated by a founding member; a member-led walking tour of the North Coral Gables neighborhood; a visit to Miami’s new Performing Arts Center; a Miccosukee Heritage bus tour; and a bus tour of African-American Contributions to Miami’s Heritage. These trips reminded members why Villagers work so hard to maintain South Florida’s rich history. One officer went to Pittsburgh to attend the annual conference of The National Trust for Historic Preservation. The Villagers added approximately $48,000 to available funds for restoration and scholarships: from the annual Holiday House Tour, “Travel Through Time: 1860-2004,” $25,920.70 was raised (which included $3,974.50 from the sale of angels, jewelry, breads, and chutney); from the Spring Garden Tour, $12,791.40 was generated (which included $2,438 from the boutique sales and quilt raffle); and from the annual event at Bloomingdale’s, another $6,103.75 was raised. To better plan how to avoid emergencies that might occur at its sponsored events, The Villagers created a Crisis Management Committee. Earnings were put to work by contributing $25,000 for Markers on the Miami River; $25,000 for restoring the lighting in historic Courtroom 6-1 of the Dade County Courthouse; $25,000 for restoration of the entrance to Pinecrest Gardens (the former Parrot Jungle); $8,000 for three obelisks in a historic South Miami Neighborhood; and $250 for the Vizcaya defense fund, to keep a high-rise from looming over the historic gardens. Also, $3,000 scholarships were awarded to each of six university students, three DASH student scholarships of $1,000 each, and three $500 scholarships, all donated by Villagers and friends. A total of $22,500 was awarded in scholarships to promote historic preservation. Dade Heritage Trust recognized The Villagers, Inc., with an award for Outstanding Preservation Organization. 2005-06 proved to be a year of challenges with direct hits from two hurricanes and a serious threat from a third hurricane. Nevertheless, members were determined and persevered in fundraising efforts. First, the Bloomingdale’s Charitable Event, postponed because of hurricane damage, was rescheduled and ultimately raised $5,825 due to the hard work of members. Then, the Historic House Tour, “Regal Residences of Coral Gables” went forward with stunning success, earning $22,779 plus another $4,680 in sales and marketing. In spite of hurricane damage, The Villagers were able to present the beautiful Garden Tour in the spring, generating a total of $17,000. The Historic Hunt, “Passports to History” was frantic and fun, earning $8,081, including auction proceeds. A donation of $25,000, from the estate of Dottie Zinzow, a former life member of the organization, established a $500 scholarship to a DASH student for six years, the perpetual funding of the Dottie Zinzow Memorial Scholarship (to be awarded to a University of Miami student), and added $1,000 to the renamed Dottie Zinzow Library. This gift allowed the group to increase to six the number of scholarships awarded each year. Four were awarded to UM students, one to an FIU student, one to a UF student, and four to DASH students, for a total of $20,000 in scholarships, which included $1,500 from private donations. In recognition of continued scholarship efforts for University of Miami students, the University presented The Villagers an award for outstanding contribution to the University. The remaining money raised this year was used for donations of $17,765 for the restoration of a house to be used as the office of Save-a-house, $7,200 for repairs on the Boat House at The Barnacle, and $17,000 for various repairs and changes to the Woman’s Club of Coconut Grove to bring it into compliance with building codes for access by the handicapped. On the national level, two officers attended the National Trust for Historic Preservation in Oregon. In addition, the annual meeting in Coral Gables of the Florida Trust was hosted by The Villagers. Member activities throughout the year included attending a performance of “Grease” at Actors Playhouse, a trip to Mt. Dora, a visit to the Fairchild Garden Chihuly exhibit, and a trip to Savannah. A cruise up the Miami River was organized by The Miami River Commission in recognition of The Villagers’ sponsorship of five information markers on the banks of the river. In 2004-05, Villager help was sought for conferences and political causes involving preservation. Of great importance was a General Obligation Bond to appear on the November 2 ballot that would provide funding for a 13-year period for many community needs including preservation. The Villagers attended hearings and provided refreshments for an educational event on the bond issue at Vizcaya. Success was achieved with a "yes" vote on Election Day. Next a World Heritage Conference reception and dinner was hosted at Venetian Pool and The Villagers received effusive thanks and recognition for their contribution. Fundraising efforts began in earnest in October with the Bloomindales Shopping Benefit that raised $5,451. On a picture perfect day in December, the annual Holiday House Tour, "A Garden City Vision," featured homes in the area around the newly renovated Coral Gables Country Club. Signature Christmas angels and jars of chutney were featured items in the boutique which included several other vendors. A record $29,000 was added to the coffers. In the spring, the "Tropical Treasures," garden tour, opened gardens along Old Cutler Road and in Pinecrest. Several gardens had water features. The Villager boutique, an art show, lectures and food tastings all added up to a wonderful experience for attendees and added $16,400 to the treasury. The Historic Hunt and Silent Auction was held in the spring for member enjoyment. After searching for the clues in Coral Gables and Coconut Grove, hunters enjoyed dinner under the stars in the private garden of Jim Herrera and Rod Hildebrant in Coral Gables. The event netted $4,000. Former Villager president, Kay Gardner and the Gardner Family Foundation donated $5,000 to The Villagers for restoration and scholarships. The Villagers donated $7200 to The Barnacle for boathouse restoration, $10,000 to the Florida Trust for its annual conference and $250 for the purchase of a brick to benefit restoration of Virginia Key Beach. The group also donated $2,000 to Florida Atlantic University to support scholarships for the African-American Heritage Conference. A sixth $3,000 scholarship was added to the existing five this year because of so many qualified applicants. On the education front, The Villagers continue to provide a suitcase exhibit and workbook to 4th grade students. In addition, this year members agreed to establish a partnership with DASH to facilitate development of a Secondary Heritage Activity Notebook and other ad hoc Villager projects. The President and 1st Vice President attended the National Trust Convention in Louisville, Kentucky. All members had a "photo op" at the May meeting where pictures were taken to be added to the yearbook. Special events included a trip to Mt. Dora with a stay at the historic Lakeside Inn and attending Renninger's Antique Show. In the spring many members and guests enjoyed the musical "Aida" at Actor's Playhouse, Miracle Theater in Coral Gables. In 2003-04, The Villagers were able to make several generous donations to local preservation projects. The group was so successful in fundraising abilities in the past few years, that a number of projects were supported in the name of preservation. The group donated $15,000 to Coral Gables Congregational Church for the repair and installation of a lightning protection system. We presented a check of $20,000 to The Historic Hampton House Trust at a press conference that attracted extensive media coverage. This money will help to restore and preserve the Hampton House Motel, where Martin Luther King gave his first “I Have a Dream” speech. Villagers also donated $4,000 to the Curtiss Mansion in Miami Springs for the restoration of the entrance gates. A donation of $1,000 was given to Coral Way Elementary School to restore a WPA sundial; allocated $13,000 toward the restoration and move of the “old Miami High” building; and donated $14,800 to air condition the former residence of Robert Montgomery at the Montgomery Botanical Center. The amount of scholarships increased from $2,000 to $3,000 for five scholarships. An additional $3,000 scholarship was awarded this year in memory of Betty Ciaffone. Villagers helped form the Coalition of Historic Preservation Groups to encourage networking and distribution of information among preservation groups in Dade County. The group was honored to receive the Florida Trust for Historic Preservations’ “Outstanding Achievement by a Group, Business, Neighborhood or Other Organization for Their Achievements in Preservation” award. Generous donations did not stop the group from refilling its coffers. The Bloomingdales' Shopping Benefit brought in $4,333. The “Winter White House” Holiday House Tour on Key Biscayne was truly special. It featured Richard Nixon’s Winter White House, along with other houses in the compound and good friend Bebe Rebozo’s former home. The Winter White House has since been demolished, as have the houses used by the Secret Service. The “helipad” house has often been seen in movies. Guests enjoyed scrumptious Villager refreshments along with a panoramic view of Miami across the bay. A “Patriotic Pride” raffle quilt was perfect in the presidential setting. By the end of the day, the group had made $24,600. The Garden Tour, “A Tapestry of Gardens,” featured tropical retreats in Pinecrest and again had an art show, lectures, chefs presenting food for tasting, a book signing and landscape designers on site to give talks and to answer questions. With the boutique and ticket sales, $10,000 was raised. The Historic Hunt was revived after a two-year hiatus. It was planned for member enjoyment with a member-contributed silent auction. It ended with a dinner under the stars in the private garden of Jim Herrera’s and Rod Hildebrant’s home in Coral Gables. The event netted $5,200 and all attendees were thrilled that the Hunt had been restored. The president attended the National Trust Convention in Denver, Colorado. Member special events included a tour of past Villager projects, and in the spring, a group went to Orlando to see the Tiffany Glass Collection at the Morse Museum. The 2002-03 year began with another Bloomingdales’ Shopping Benefit, and the group got a head start on holiday shopping while adding to the coffers. The Holiday House Tour offered “Entrada Enchantment,” a tour of some beautiful homes in Coconut Grove with spectacular water views. The “Stiltsville” quilt was perfect for the setting. The Garden Tour took a different twist this year. It was an all-day Garden Gala at historic Java Head in Coconut Grove, a four-acre estate owned by Dr. Jim and Sallye Jude. Table settings were placed throughout the gardens. Chef demonstrations were featured with food tasting, an art show, a vendors’ tent, music, landscape consultants, several lectures and box lunches for sale. It was a resounding success and very positive feedback was received from attendees. As special events for members, there was a tour of Gusman Hall and a Great Villagers’ Train Trip, a ride by Tri-Rail to Delray Beach for an historical tour and lunch. The group gathered as many past raffle quilts as could be found and had a special display at the Ocean Waves Quilt Show at the Coral Gables Youth Center in the spring. An Historic Sites Survey Workshop was held to train volunteers to conduct neighborhood surveys. Work continued on the Stan Cooper Cottage with archiving, packing and storing the contents for the move to Charles Avenue. Eight scholarships were awarded because there were so many exceptional applicants. The 2001-02 year got off with a shop-till-you drop day when the group again took part in the Bloomingdales' Shopping Benefit. The Holiday House Tour, “Stunning Seclusion,” took place in historic Stonegate on Ponce de Leon Road. An early downpour didn’t dampen attendance or profits. The Garden Tour, “Tropical Retreats,” featured a garden on Old Cutler Road and four in Pinecrest. The Villagers co-sponsored, with the City of Coral Gables and the Florida Trust for Historic Preservation, a “2002 Spring Insider’s Tour or Coral Gables: The City Beautiful,” which was a two-day event. Members continued to work at packing items in the Stan Cooper House in anticipation of the move. In January, a number of members attended The Seminole Theater and City of Homestead Community Redevelopment Agency ribbon-cutting ceremony for the lighting of the marquee on the theater. The Villagers pledged $25,000 to the Miami River Commission’s Greenway Project for approximately 18 historic markers. Designated sites are part of a plan to open up the river for tourism and public green spaces. An important element of the project is the preservation of historic sites and structures and their incorporation into the public greenway. The group also gave $1,000 to the Black Archives, History and Research Foundation of South Florida for help in printing a brochure describing the area around the Lyric Theater in Overtown, where the group held a meeting in September. $3,625 was allocated to Dade Heritage Trust for reprinting their fourth graders’ activity book about Dade County History. Also, $2,500 was given to the Coral Gables Library to refurbish Merrick family antique chairs. Membership categories changed to include a designation as “Life Member.” To qualify, one must have been in The Villagers for 15 years and active for 10 of those years. Dues are lower for this category. 2000-01 began with a new small fundraiser, the Bloomingdales' Shopping Benefit. The Villagers received a portion of ticket sales and a percentage of store sales for the day. The Holiday House Tour, “Old Masters,” featured homes designed by some of the early architects of Coral Gables. The boutique was chock-full of gift items, breads, chutneys, Villager angels and a stunning raffle quilt depicting the Everglades. The Historic Hunt was again a successful event ending at The Country Club of Coral Gables. For the first time the Garden Tour was held on a Saturday, which proved to be a hit. “Romance in the Garden” featured romantic venues in the north part of Coral Gables and a former equestrian complex on Red Road. This year The Villagers produced a video describing our organization and the many projects completed and funded in the community. It was designed to tell who The Villagers are when approaching groups or businesses for funding or grants. Many members went on a field trip to the Bonnett House in Fort Lauderdale. The major preservation project was a donation of $10,000 to the Stan Cooper House for its relocation and the interpretation of one man’s collection of extensive Miami memorabilia. The group also donated $10,000 to the Woman’s Club of Coconut Grove, $660 to Merrick House for benches for the garden and $16,000 to Overtown Revitalization. For the first time, in 1999-2000, a special new-member restoration project was begun to actively involve new members in learning about preservation. 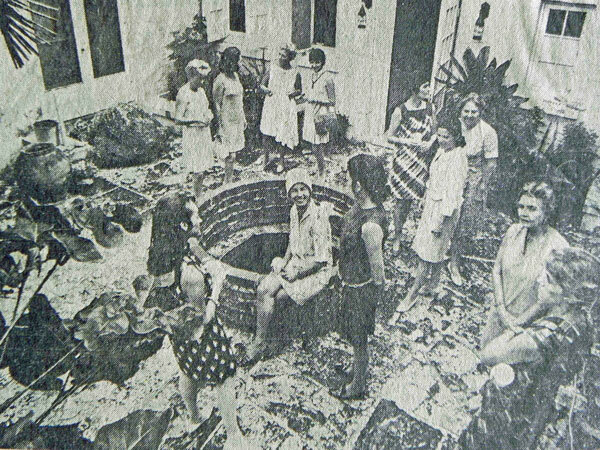 Their project was the restoration of the fountain at the Coral Gables Women’s Club. A fundraising event at the Venetian Pool, “One Woman Show,” featured the artwork of Lynn Fecteau. Her original painting of the fountain at the Women’s Club was auctioned, and she gave the Villagers reproduction rights for notecards and posters. The new members raised $3,000 at this event. In the spring, they helped sponsor an interactive gourmet lunch at the Biltmore with a celebrity chef. The extremely successful Holiday House Tour, “Merrick’s Dream,” featured five homes in his various thematic villages in Coral Gables. The Garden Tour was held in Snapper Creek Lakes and the Douglas Road area. Tours were offered of the Montgomery Botanical Center, rarely open to the public, proving to be a big draw and one of the groups’ largest tours. The Historic Hunt again led hunters on a merry chase, ending at The Country Club of Coral Gables. Dinner and dancing followed, with a silent and live auction called by celebrity auctioneer Bob Soper of WFOR-TV4. A record $21,199 was raised. The president attended the National Trust convention in Washington, D.C. and special outings for members included trips to the Key West House and Garden Candlelight Tour. This year’s preservation projects were donations of $25,000 to help restore the Marjorie Stoneman Douglas home in Coconut Grove and $2,000 to the Miami Circle fund. Due to the work of new members, $20,000 was awarded the Coral Gables Women’s Club for the restoration of their fountain. 1998-99 was a busy year. Drawing on ideas from the Merrick House Retreat, The Villagers focused on education, membership and marketing. To learn about preservation in the state, the president attended the Florida Trust meeting in Tampa. To learn about efforts throughout the country, she and another member attended the National Trust meeting in Savannah. To increase public awareness of The Villagers’ mission, the new tagline, “dedicated to the restoration and preservation of historic sites,” was added under the logo on all printed materials used or distributed by the organization. For the first time, money was allocated for educational grants. The funds are to be used to send government or education officials to seminars or workshops relating to historic preservation. Also, to increase awareness of work done in preservation, the group underwrote membership in the National Trust for commissioners and city managers of Miami and Coral Gables. To complete a project from the previous year, bookmarks with a history of the Lighthouse Keeper’s Cottage were printed in English and Spanish for distribution to schoolchildren touring the cottage. Fundraisers included the Holiday House Tour, featuring “The Estates of Old Cutler,” and the raffle quilt entitled “Mariner’s Compass.” The Historic Hunt ended with a magical night at the Venetian Pool, including dinner and a silent auction. Once again, members volunteered at the Lipton Tennis Tournament to raise money. The Garden Tour was a two-day affair in The Moorings in Coconut Grove. Five scholarships were awarded this year. A major donation of $25,000 was given for a replica of the marquee of the Seminole Theater in Homestead. The group gave $3,405 as a matching grant to air-condition Dr. Fairchild’s study at The Kampong. $2,000 was given for the donor wall at the Junior League of Miami headquarters, located at the oldest commercial building in Coral Gables and a donation was made to the Community Foundation in memory of preservationist Mary Ann Ballard, founder of Cauley Square. 1997-98 was a preservation year of finishing well and beginning anew. The highlight was the successful completion and rededication of the Cape Florida Lightkeeper’s Cottage, Cookhouse and Cultural Complex after three years of hard work. The Villagers were honored by the State of Florida, Friends of Florida State Parks, Dade Heritage Foundation and Harbour Lights for superb results in preserving the living history of the early lightkeepers and their families. Not resting on laurels for a minute, The Villagers selected The Housekeepers Club building, which is now home to the Women’s Club of Coconut Grove, for a new preservation project. The group pledged $40,000 to help replace the windows so the building could be air-conditioned. $5,000 was committed towards the restoration of the historic Dade County Courthouse lobby and the group spruced up a past project, Dr. David Fairchild’s study at The Kampong. Traditional fundraisers continued to be successful. The Holiday House Tour was centered around Plymouth Congregational Church, which was celebrating its centennial. The Historic Hunt went back to the site of The Villagers’ first project, the Douglas Entrance, and the Garden Tour featured gardens in Coral Gables. Hundreds of volunteer hours were worked at the Lipton Tennis Tournament, bringing in a significant new source of funds. In June, members held their first ever retreat at the Coral Gables Merrick House, where they reviewed their heritage and made long range plans for continued effectiveness. Both the President and Third Vice President were sent to the National Trust Convention in Santa Fe, New Mexico. Members had an outing to Mt. Dora that was greatly enjoyed. 1996-97 was the 30th anniversary of The Villagers. The main preservation project was the continuation of work on the Lighthouse Keeper’s Cottage. Many hours of research and planning went into all aspects of the project. A video theater was installed in the kitchen building for viewing historic and educational videos. This has been The Villagers’ largest involvement in a restoration project, totaling $110,000. The group obtained a $10,000 grant from the City of Key Biscayne to produce the video “Jewel in its Setting: A Visit in Time on Key Biscayne,” describing the lifestyle of the lightkeeper and his family in the 1800’s on Key Biscayne. It is now shown in the Cookhouse Theater. The Holiday House Tour, “Island Fantasy,” showcased five waterfront homes on Key Biscayne and netted a profit of $9,285. The Historic Hunt concluded at The Barnacle with dinner and a silent auction, which added $8,043 to the groups’ coffers. The Garden Tour was another success and resulted in a profit of $2,593 with another $1,009 coming from the boutique and small quilt raffle. Fundraising goals were reached by selling cottage notecards for a total of $2,580, and 5,260 worth of the cookbook inventory. The group voted to give an extra scholarship because there were such qualified applicants. 1995-1996 $60,000 Grant for Lighthouse Keeper’s Cottage + $40,000 Match = $100,000! 1995-96 saw The Villager name spread far and wide. Stepping outside the normal venues, a fabulous Holiday House Tour was held Miami Beach, with bus transportation and lunch provided. The event netted nearly $11,000. Villager booths at the Harvest Festival and the Key Biscayne Art Festival were wonderful outlets to sell wares and spread the word about historic preservation. A “El Jardins Jewels” quilt, angel ornament, chutney, homemade breads, The Villager cookbook and new lighthouse notecards made over $6,000 at these and other events. The Garden Tour, with its expanded boutique, was delightful. The Historic Hunt, featuring a Centennial theme, was a wonderful romp around town ending at the Port of Miami’s Terminal 10 for dinner, dancing and a silent auction. The event raised $9,400. The most ambitious project to date was the restoration of the Lighthouse Keeper’s Cottage at Bill Baggs Cape Florida State Recreation Area. It included installing museum displays in the cottage, turning the detached kitchen into a state of the art theater, devising an archeological dig display in the cistern and providing signage along the Cultural Trail of historic gardens. Our donation of $60,000 qualified under new legislation for the first matching grant from the State of Florida of $40,000. These funds will provide the public a fascinating experience in living history when they visit the Cape Florida lighthouse. A fourth $1,500 scholarship was established, named in memory of Villager Henriette Harris, to benefit a student at the University of Miami. In addition, The Villagers restored the displays of historic memorabilia in the old Coconut Grove Schoolhouse at Plymouth Congregational Church. For the first time, the group sent two Villagers to the annual convention of the National Trust for Historic Preservation in Fort Worth, Texas. 1993-94 was a year of new ideas. Members sold quilt raffle tickets at The Harvest Festival, The Villager House Tour and at the Fairchild Ramble. The group took on a project at the Fairchild Tropical Gardens. The Fairchild Tropical Museum was established with a $3,000 matching gift from The Villagers. The museum, located in the former caretaker’s cottage, supports historical education, including Dr. Fairchild’s life and time, plant explorations, etc. The highly successful Holiday House Tour included a home in Journeys End and four homes in Snapper Creek. For the first time a craft boutique was added. New efforts extended to the Garden Tour by having an orchid boutique, unique crafts pertaining to the garden as well as adding members’ chutney, jams and herb vinegars. Exceptional publicity helped double profits from the previous year. Channel 17-WLRN produced a documentary on the Garden Tour and the groups’ work on Dr. Fairchild’s study at The Kampong. The Historic Hunt was a “Blue Moon Fiesta” held at the Key Biscayne Club under a nearly full moon. New heights were reached in fund-raising profits during 1994-95. A red and white “Flagler’s Railroad” quilt earned $1,800. The Holiday House Tour, the largest ever with over 1,000 tickets sold, featured six homes in The Moorings. Profits exceeded $14,000. The group also realized $4,000 from the Garden Tour in the spring. Handmade items were an important addition, with both a social as well as financial value and, this year, yielded more than $3,000. The group’s famous Christmas angel has become a popular tradition. Held at the First Presbyterian Church, the Historic Hunt earned over $9,000. The hunt, dinner, dancing and the largest silent auction to date ensured its success. Four scholarships were awarded this year and the group donated $2,500 to the Coconut Grove Schoolhouse at Plymouth Congregational Church for property repairs and landscaping. Special events for members included trips to Whitehall, the Flagler Museum in Palm Beach, the Ft. Lauderdale Christmas Boat Parade, a lecture at the Biltmore, and Charleston, S.C. The 1992-93 year was unlike any in the groups’ history. Hurricane Andrew hit with a vengeance, affecting all members. In true Villager spirit, the group rallied to present a spectacular candlelight tour of historic homes and sites in Coconut Grove for the National Trust for Historic Preservation during their national conference in Miami on October 7th. The Barnacle Society and Plymouth Congregational Church were each presented with $1,000 from the proceeds of the candlelight tour. The quilt, “Biscayne Bay,” raised $1,300. A smaller version of the quilt was made and donated to Preservation Action for their annual auction. Historic homes on North and South Greenway Drive in Coral Gables were included on the Holiday House Tour. Outstanding attendance along with increased boutique sales raised funds for scholarships. The second Garden Tour was a blooming success in every way. The Historic Hunt and Hoe Down was held at the Douglas Entrance and featured a square dance. The group donated $5,850 for the restoration of a Denman Fink marinescape painting and a new faux coral rock frame. The painting hangs in Coral Gables City Hall. The Villagers received the 1993 Historic Preservation Organization Award from the Florida Trust for Historic Preservation. 1991-92 marked the organization’s 25th anniversary, and was celebrated with a lovely catered dinner at the Coconut Grove home of one of the founding members. Past presidents were all invited as special guests. A blue and white “Ocean Waves” quilt raised $1,200. The Holiday House Tour featured two homes in Cocoplum and two homes and a sculpture garden in Gables Estates. A Garden Tour in the spring was a new event, which generated additional funds. The location of the Historic Hunt was the Douglas Entrance, site of the first project 25 years ago. “Paella on the Plaza” was the theme. The project this year was to begin the restoration of Dr. Elinor Galt Simmons’ limestone barn and Dr. David Fairchild’s attached study. $30,000 was donated to The Kampong of the National Tropical Botanical Garden for adaptive reuse of these structures. 1990-91 saw an increased membership. The second Villager quilt was made to commemorate the groups’ help in the restoration of the Coconut Grove Schoolhouse. It was very popular and raised $1,400. The House Tour, which featured homes near Vizcaya, was larger than ever and funded scholarships. The scholarship to the University of Miami was renamed in honor of Nancy Chambers Pierce. The Historic Hunt had a shipwreck theme and ended at the Charles Deering Estate. Money was donated to repair the roof of the Coconut Grove Schoolhouse. The 1989-90 year was kicked off by a fashion show at Burdines hosted by renowned interior designer, Mario Buatta. Display boards and a brochure were created to tell The Villagers’ story to the public at the numerous events in which the group participates. Members made the first Villager quilt for a House Tour raffle. It had a border of waves and palm trees for a Florida feel. A record number of guests attended our Holiday House Tour in Coconut Grove’s historic Entrada area, founded by Hugh Matheson. The Historic Hunt had a safari theme and again was held in the gracious setting of the Charles Deering Estate. Donations were given for the restoration of classical statues at the Gusman Center for the Arts, for the painting of the Barnacle and to the Deering Foundation. In 1988-89, the House Tour was held just before Christmas and was the most successful to date. It featured homes in the South Miami area. A generous monetary donation and 45 books of green stamps were presented as a birthday gift to The Barnacle. The Villagers also joined The Barnacle Society and earmarked additional funds for the restoration of the wicker furniture, oriental rugs and pictures. At the Society’s request, The Villagers helped decorate The Barnacle for the Christmas season, and still continue this tradition. At the Commodore’s Birthday Party, The Villagers were presented a plaque for their numerous contributions. Due to the closing of the Metropolitan Museum, The Villagers chose different historic sites and points of interest for general meetings. A monetary donation was made to the Coral Gables Women's Club for the restoration of its historic property. The Historic Hunt again ended at the Charles Deering Estate with a luau theme, and a silent auction was added. Scholarships were increased from $500 to $1,500 for each university. 1987-1988 Cookbook, “Biscayne Bights and Breezes” Makes Its Debut In the 1987-88 year, the October House Tour was very successful. The cookbook, “Biscayne Bights and Breezes,” was formally introduced to Miami on November 7th at the Biscayne Bay Yacht Club, which was celebrating its centennial year. Both the party and the book received rave reviews. In January, the members held “The Challenge,” dividing into three teams to sell cookbooks. Countless hours and true dedication were devoted to the sales and distribution of the cookbook. The fourth annual Historic Hunt once again crisscrossed Miami from downtown to the Charles Deering Estate, where participants dined on The Villagers’ trademark gourmet cuisine. The group donated $660 to the account for the restoration of the Deering Estate and $100 to The Barnacle. The Villagers continued to offer three scholarships and renamed the scholarship given to a University of Florida student in honor of Dorinda Wenck. The 1986-87 20th Anniversary year was full and varied. Painting the wrought iron at the Venetian Pool in Coral Gables was the hands-on preservation project. A June fundraiser, “Food as Art,” was presented by Burdines and featured the state governor’s former chef. The fall House Tour of the French Village in Coral Gables was a great success. A rummage and bake sale contributed to the cookbook fund. A special historic tour and luncheon for the Key Biscayne Women’s Club added to the groups’ coffers. A February House Tour in The Moorings funded scholarships. The Third Historic Hunt ended with a delicious supper at the Charles Deering Estate. Funds raised from the Hunt were held in trust until the County could complete restoration plans. The group contributed $100 to The Barnacle and $100 to the Metropolitan Museum, in addition to having the Museum’s fountain cleaned. In 1985-86, The Villagers decided to publish a cookbook to commemorate their 20th anniversary. It included introductions written by prominent early Miamians, members’ recipes that were thoroughly tested, sidebars of old Miami photos and interesting bits of history. To underwrite the project, members gave a house tour in Coral Gables and a theater party in Coconut Grove. The second Historic Hunt ended at Carrollton School and benefited the scholarship fund. An educational suitcase exhibit for use by fourth grade students was created this year. Members toured Calle Ocho in Little Havana. Donations of $100 each were given to The Barnacle, Carrollton School and the Metropolitan Museum. During 1984-85, the fashion show luncheon netted $1,500 for scholarships. One hundred dollars was donated to the fund to fight for the Barnacle Extension. Two hundred dollars was donated to Dade Heritage Trust to assist in the reconstruction of the Brown House. Our spring fund-raiser was our first Historic Hunt and Car Rally with a barbecue afterward at Tropical Park. The major project for 1983-84 was raising funds toward the purchase and preservation of the Tennessee Williams home in Key West (this project was later cancelled and funds re-allocated). We hosted a theater party for “Cat on a Hot Tin Roof” at the Players State Theater in Coconut Grove. A secondary project was the donation of two dockside flagpoles for Vizcaya. In April, members voted to change the Judith Seymour Memorial Scholarship from a year’s tuition at Florida International University to three scholarships of $500 each for students at Florida International University, the University of Miami and the University of Florida. 1982-1983 Teaching Others How to Apply as Historic Site on the National Register The 1982-83 year for The Villagers began significantly with the adoption of a new logo, which incorporated the seashell design used in the past. Note cards were printed depicting many of The Villagers’ previous restoration projects. The fall fundraiser was a house and garden tour followed by a luncheon at the Biltmore. Members decorated a Christmas tree at Vizcaya, and sponsored a seminar on the process for placing an historic site on the National Register. The spring fundraiser was a Monte Carlo evening at the Victor Hotel in Miami Beach’s Art Deco District. A commitment was made to raise funds to restore the Old Coconut Grove Schoolhouse. In April of 1981, the organization held a two-day major fundraiser called “Oh! Henry.” This comedy production was about Miami’s past and present. The Villagers were able to donate an additional $5,500 to the Alamo Restoration Fund, making a total of $8,000. The hands-on project for 1981-82 was the restoration of the Old Larkin Schoolhouse on the grounds of Sunset Elementary School. In October, a luncheon–fashion show was held to benefit the Villager scholarship fund. In February1982, a Tea Dance was hosted at the Biltmore Hotel. From the proceeds of this and other Villager fundraisers, The Villagers donated $25,000 to the Metropolitan Museum of Art (fountain is part of the Biltmore) for restoration of the fountain area at the entrance to the museum. On May 22, many dignitaries, including the Mayor of Coral Gables, attended the dedication of the completed fountain area. Our “Colouring Book” was published in 1978. It featured twelve excellent line drawings by Linny Heagy-Len of historic Dade County sites dating from 1846. The sketches have also been used for Villager note cards, wrapping paper and illustrations for our cookbook and yearbooks. When the Alamo, the original Miami City Hospital building, was in danger of being razed, a group of hospital personnel and preservationists began a “Save the Alamo” campaign. The Villagers made a $500 donation. Sufficient funds were raised and the Alamo was moved to a new site in December of 1978. The Villagers were asked to research and file documentation for placing the Alamo on the National Register of Historic Places. In April 1980, the group donated an additional $2,000 toward the Alamo restoration expenses. Due to growing Villager expertise in research and documentation of historic buildings, other groups had asked for help on their properties. Among these were the Audubon Society for the Thomas home on Sunset Drive, which is now the Audubon House, and the Sylva Martin Community Center in South Miami. In 1978, with the help of prominent preservation architect Hershal Shepard, The Villagers evaluated the Bulmer Apartments. 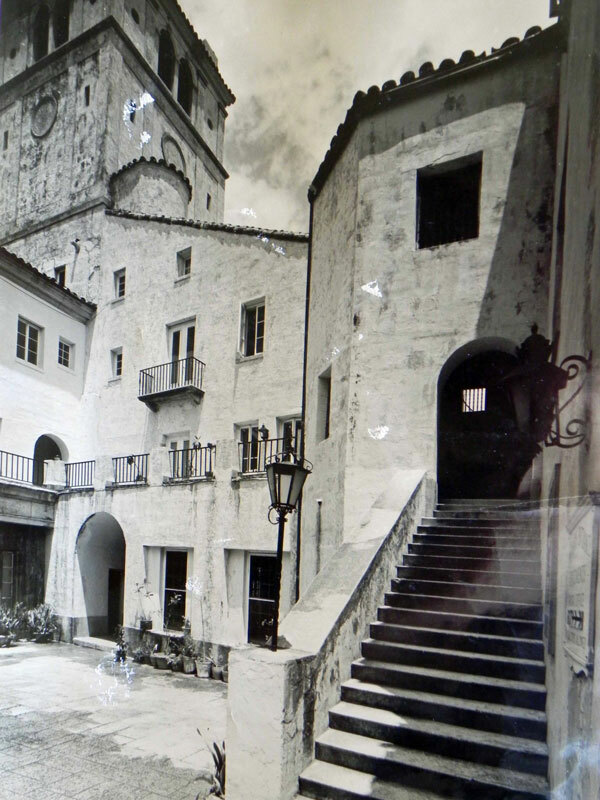 Restoration in this instance was found to be unfeasible. However, usable hardware was removed for future restoration projects and warehouse space was obtained for the storage of building materials, books and records. Another documentation project was the 1897-99 Flagler Workers House, later known as the Butler Building. In 1980, the house was moved to Fort Dallas Park on the north side of the Miami River. In 1979, The Villagers sponsored a tour of the King Tut exhibit in New York. The group continued support of Vizcaya by helping to build a “Hammock Walk” from the villa. Some members cleared underbrush. A check for $500 was presented to the director for botanical labels and additional clearing. The Judith Seymour Memorial Scholarship Fund was established, and the first scholarship went to a Florida International University student. When the City of Coral Gables took over the Merrick home, renaming it Coral Gables House (now Merrick House), The Villagers participated in the renovation and restoration effort. The group assumed responsibility for the porch areas, donating $1,000 and spending additional sums for refinishing and upholstering wicker furniture. Another restoration project was the center courtyard of El Jardin, a bay-front mansion in Coconut Grove, which is now Carrollton School. In order to restore the patio to its 1918 beauty, The Villagers found an artisan to make matching tiles and replace broken ones. The area was cleaned, re-tiled and brightened with new planting. On March 11, 1978, The Villagers sponsored “Pioneer Day” to commemorate the 105th birthday of Coconut Grove with crafts, exhibits, old-fashioned games and costumes. That night Villagers’ held a Bahaman style Conch Dinner. With variations, Pioneer Day was repeated in 1979 and 1980. Beginning in January 1977, The Villagers presented “The History of South Florida,” a series of three free seminars by Samuel Boldrick, Arva Parks and Dr. Thelma Peters. In February, bus tours were launched of historic Coconut Grove and Coral Gables for the public and convention groups. Money was donated to the Metropolitan Museum of Art to help renovate the Country Club building at the Biltmore for their new home (the Museum occupied the building for 10 years and it is now part of the Biltmore property). In April, members journeyed to Palm Beach by chartered bus to enjoy a day of touring the Henry Flagler Museum, sightseeing and shopping. National Preservation Week in May was celebrated by sponsoring an old-fashioned ice cream social at the Coconut Grove Schoolhouse on the Plymouth Church grounds. A fashion show coffee was again held with new members as models in November of 1977 at Indian Spring, the beautiful home of Dr. Walter Garst. The next preservation project was Anderson’s Corner, the oldest existing store building in Dade County. After helping to fight possible demolition, members did intensive research and filed documentation in Tallahassee, which resulted in Anderson’s Corner being listed on the National Register of Historic Places. The Villagers were recognized for their work during a dedication ceremony in December of 1977. Over $23,000 and hundreds of hours went into publishing Outstanding Homes of Miami, which went on sale in December, 1975. A wine tasting and fashion show with the Italian Trade Commission was held on the Mound at Vizcaya to help defray publication expenses. In January of 1976, an elegant publication party was held in a pre-1920’s Brickell Avenue mansion that was featured in the book. As a Bicentennial project in 1976, The Villagers inaugurated free walking tours in Coconut Grove. The tours were so popular they were continued as a community service. The Villagers also helped with the Fairchild Ramble, participated in the Harvest Festival and exhibited at the Dade Heritage Trust Antique Show. During 1976, members provided house tours by bus, with lecturers on local history, for several convention groups. New members modeled for a fashion show coffee in October at Hammock House, a contemporary Florida “natural” style home. A train tour to Savannah was sponsored for members and the general public to visit historic homes and sites. In the summer of 1973, under the direction of the Florida Division of Archaeology, History and Records Management, a survey of historic and architecturally interesting sites in Dade County was begun. The Villagers contributed $1,000 toward underwriting this survey plus volunteer hours. This survey became a continuing project. In the fall of 1973, a book tracing the Miami lifestyle through its homes, from the pioneer to the contemporary, became a major project. When the Douglas Entrance was sold in 1972, The Villagers turned their attention to another endangered landmark, the Biltmore Hotel, and expanded their mission to include protection of landmarks throughout Miami-Dade County. The Biltmore had last been used as a hospital by the Veterans Administration. After it was vacated, The Villagers held a party in the Casa Loma building (demolished in 1974) and patio to promote interest and support for the preservation and use of the Biltmore. An outdoor evening fiesta with street dancing under the Douglas Entrance arch benefited the Biltmore restoration effort. The next renovation project was at Vizcaya. Both rooms in the Casino on the Mound were beautifully restored with Villagers again doing physical work where possible and supplying funds for the technical work, materials and furnishings. Villagers’ also had the bathroom below the Casino repaired and refurbished. In February of 1972, The Villagers held a unique fund-raising party called “Kinshasha” with Neiman Marcus and the Crandon Park Zoo in the courtyard of Vizcaya. Animals from the zoo, dancing and champagne enhanced this red carpet fashion show, and it enabled the contribution of $500 to the Zoological Society for the new zoo. Dade Heritage Trust Established Also in 1972, realizing the need to increase interest in preservation and restoration in Dade County, the organization voted to help form a new group, Dade Heritage Trust. The Villagers and its members were instrumental in the creation, formation, support and success of the new Trust. The Villagers Incorporated was organized in October 1966. The Douglas Entrance was in danger of being demolished when the Douglas Village Corporation was formed to save and restore it. As a part of the initial restoration efforts, a group of wives of the stockholders of the Douglas Village Corporation got together as an auxiliary to do what they could to help. This group, joined by others, became the charter members of The Villagers. Early efforts included cleaning, painting, and chasing pigeons from the tower. The major emphasis was on refurbishing the elegant ballrooms. Events were held to raise money for restoration and to raise public awareness of the needs and benefits of preservation. The first fund-raising success was an all-day “Fiesta,” when Coral Gables declared November 25th as “Villagers Day.” Peruvian gold jewelry, other imports, craft and art items, foreign foods and decorator “mistakes” were sold and auctioned. The popular and profitable Monte Carlo Night was begun in 1968 and held at the Douglas Entrance for the first two years and at Vizcaya for the next three years.